Highlight with the No.1 Disc support, it has helped worldwide users to backup and digitize over 30 million DVDs from any regions of any ages. No DVD playback or decoding issues any more. Submission successful. Thanks! You will find the software and license in the downloaded zip file and your email inbox. Thanks for entering our sweepstakes! Please check your email. Can't Decode DVD When Playing DVD Disc? Your Problem Will Be Fixed Here! Playing DVD is not always a plain sailing, even if you install a third-party DVD decoder on Windows Media Player or spend extra $15 on Windows DVD Player in Windows 10. Most often, you get a DVD playback failure, for example, the optical DVD drive is unable to read a disc, you receive a region error while playing a UK or Japanese DVD in the USA, or the new DVD is making noise and the playback is choppy. You may even receive error messages like Windows Media Player cannot play DVD because of digital copy protection, "cannot decode disk" from Windows DVD player or "VLC cannot set the DVD's title" etc. Why Your DVD Disc Cannot Be Decoded? Possible reason 1. Your DVD disc is damaged. DVD disc is the first to blame. It's reasonable that your DVD player stops playing when reading visible scratches. However, there are cases that your DVD looks very new but it's unplayable. Probably, the DVD has scratches that are invisible to the naked eye. Or it'is intentionally used as a means of encryption like Sony DVDs. When playing/ripping Sony DVDs, bad sectors will be read in a loop (also called CRC error) until the DVD drive burnt out. Possible reason 2. Your DVD drive is corrupted or DVD driver is outdated. DVD drive can be the culprit. If it's damaged, your will encounter a DVD read error, or disc drive won't even detect DVD, CRC data error, I/O error etc. In this case, you can buy another DVD drive ($40 or so) to fix the error. And outdated driver causes a stuttering DVD playing or even makes DVD unplayable or unconvertible, since the heavy DVD decode work will be turned over to CPU from GPU. For example, some rippers drop to a rare low fps during decoding/encoding DVD due to the CUDA failing. But if you update the driver up to date, GPU will revitalize for smooth DVD playback. Possible reason 3. You don't have a compatible DVD decoder installed.Windows Media Player doesn't offer a software plug-in that enables the DVD video playback in MPEG-2 format. When you play DVD on it, you'll get an error message "Windows Media Player cannot play the file because the codec is not installed on your computer". In this case, you can install a compatible DVD decoder to slove DVD not playing issue. Make sure you download the right drivers for your architecture (32 or 64 bit). Possible reason 4. The region code of DVD player, DVD drive and disc are not the same.Region codes prevent playback of DVDs in other geographical regions, for example, region 2 discs won't play in region 1 players, and PAL discs cannot be played on a NTSC standard player. If your DVD player or DVD drive has improper region setting, you can change it up to 5 times only before it's locked permanently. Make Digital Copies of DVDs: Rather than taking $55 to buy a DVD drive ($40 or so) and Windows DVD Player ($15) for an uncertain DVD playback, ripping DVDs to digital with a free DVD ripper would make DVDs playable on any media players without consideration of DVD decoder, 32-bit/64-bit limit. Besides, you're able to store your DVD discs more securely without unexpectedly scratches or damages, and extend your DVD lifespan by minimizing the number of physical disc playback. However, 90% DVD rippers can't do that very well, causing errors like DVD not reading, crashing/freezing, incomplete DVD copy, or poor output quality etc. For that, you might as well try an easier yet more effective DVD ripper - WinX DVD Ripper Platinum, which works like a charm to decrypt CSS protected DVDs, unlock region code, remove new DVDs encryption, and fix damaged DVDs. Thanks to the unique DVD analysis kernel and title check mechanism tech, it owns No.1 disk support and ensures 99% success rate to fix DVD not reading or decoding error. Attention: Never create digital backup copies from rental DVDs!!! World's No.1 fast speed: Merely 5 min to make a digital copy of DVD under hardware acceleration. No.1 disc support for all kinds of DVDs, no matter what encryption it's protected by. Update weekly to ensure the support of decrypting various new released DVDs. 100% quality reserved for DVD digital copies, for playing on TV, mobiles, Tesla/Waymo and more. Follow the steps below to decrypt new & protected DVD to digital formats without DVD read/decode error. Step 1. Insert your DVD disc into the DVD drive, open WinX DVD Ripper Platinum, and click "DVD Disc" button to import your DVD. If you want to rip DVD to digital from ISO image or DVD Folder, you can also click "ISO Image" or "Folder" button to load it. The program will automatically choose the right title for you, no matter what encryption is used for the DVD. Step 2. Choose output format from the popup window according to your needs. For example, MP4 for playback on mobiles, MKV for full titles, audios, videos and subtitles backup, ISO image DVD clone for later burning etc. Optionally, you can also click "Edit" button to trim, crop, adjust audio volume, add subtitles and more. Step 3. Hit RUN and it will begin decrypting DVD immediately. If your computer has supported graphic cards, you can raise the ripping speed maximally with hardware acceleration enabled, merely 5 minutes to rip a full DVD movie. If you insist on playing DVD on computer with Windows Media Player or Windows DVD player, a third-party DVD decoder is ever needed, which could solve a large part of DVD won't play on Windows 10/8/7/XP. If it doesn't work, you can also try to update the graphic driver. Step 1: Open your Winodws Media Player. Note: Windows Media Player is unable to play a DVD movies on Windows 10. Step 2: In the Tools menu, click Options. Step 3: Click the Player tab, and then click to select the Download codecs automatically check box. After you've done, click OK. Step 4: Try to play the file. If you are prompted to install the codec, click Install. 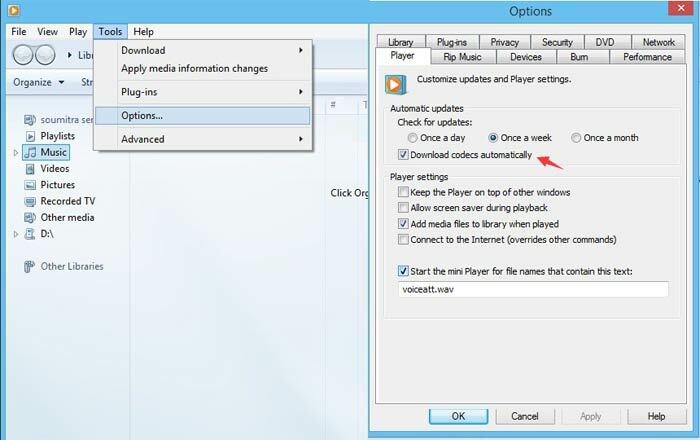 If you are not asked to install the codec and the DVD still cannot play on PC correctly, follow the steps below to manually install the DVD decoder. Step 5: Determine whether the codec is installed on the computer that you're using to play DVDs. 1. In the Now Playing area, right-click the file that you are trying to play, and then click Properties. 2. Click the File tab, note the codecs that are specified in the Audio codec and the Video codec areas, and then click OK. If no audio/video codec is specified, go Step 6 to install the codec. 1. If you receive an error message when you try to play the file, click Web Help. On the Microsoft Web site, click the link to the Wmplugins Web site to download and install the codec for the file. 2. If you do not receive an error message when you try to play the file, obtain the codec from a third-party vendor such as K-Lite Codec Pack, and install it. Step 1: Press Windows key + X and click on Device manager. Step 2: Locate for Display Adaptor and expand it. Step 3: Right click on the adaptor and click on update. 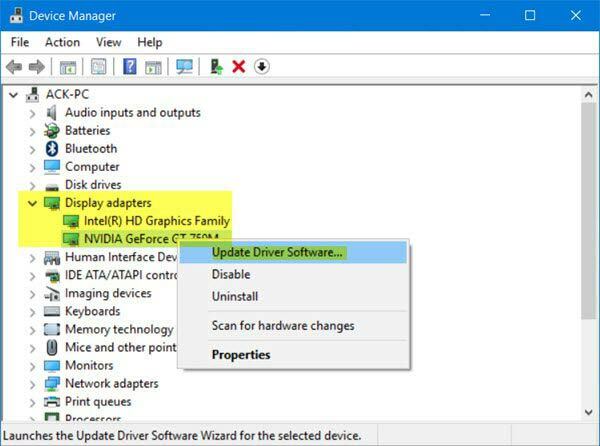 This will launch the update driver software wizard, which presents two options: Search automatically for updated driver software and Browse my computer for driver software. Step 4: Pick an arbitrary one, and click Next, then wait while the wizard completes the installation. There is no guarantee that installing a codec and updating display driver will solve "can't decode DVD" error. If you still cannot decode and play DVD on Windows Media Player or Windows DVD Player, it might be an issue of DVD drive. You can buy another DVD drive to make your DVD disc recognizable, but it will cost you $40 or so. Given that, why not choose a cheaper and easier solution to fix "can't decode DVD" error? 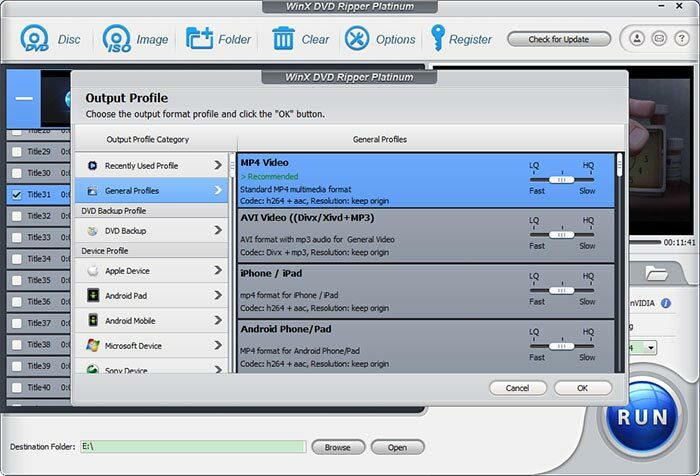 Possible Solution 3: Use 5KPlayer to Play DVD without DVD Decoding Error - No Need to Install DVD Decoder+. As above, installing DVD decoder may not be vaild to make your DVD playable. However, you need some Windows DVD decoder checkup utility to determine whether a DVD decoder is successfully installed on your Windows XP/7/8.1/10 computer and whether the decoder is seamlessly compatible with your Windows Media Player. And there are so many compatibility issues between players and DVD decoders, some of which are not even safe enough. It would be fantastic to play DVDs without downloading and installing any DVD decoder (pack). It is easier than you think! Step 1. Launch 5KPlayer on your computer. It is totally free and clean. Step 2. Insert any DVD into the DVD-ROM, and flip "+DVD" icon (the third one in the first line of UI). Step 3. When 5KPlayer prompts you to open DVD disc, you can choose the source DVD disc from your DVD Driver. Just hit "OK". Step 4. When the DVD info has been read, you can choose the language track and so on from the list. And then the player will begin to play the DVD. Step 5. 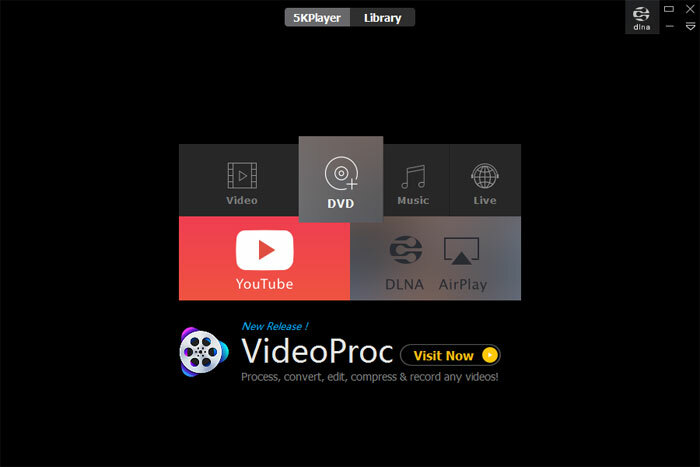 Similar to other DVD players, 5KPlayer allows you to double-click any position on the image to view the movie full size. Or you can click on the square button on the top right. You can also find your recent playlists in the "Library". DVD cannot be decoded/played on Windows Media Player and Windows DVD Player happens owing to an incompatible DVD decoder, an outdated display driver and even a broken DVD drive. Fixing it would take you a lot of time, energe and money. Therefore, ripping DVD to digital formats using WinX DVD Ripper Platinum is the fastest and most cost-effective solution recommended by us. It's capable of ripping DVD to MP4, MOV, MKV, MPEG-2, ISO image, TS etc, making DVD playable on any media players, stored more safely as well as slowing down the loss of DVD lifespan because of over-analysis. "I just tried the program with a DVD of mine, and it worked quickly and flawlessly. If you want a fast, effective, and fairly user-friendly DVD-ripping solution, WinX DVD Ripper Platinum is the way to go." No.1 Fast DVD Ripper Decoder | Decode DVD to MP4, AVI etc. How to decrypt copy protected DVD movie on Windows 10 or Mac for saving on NAS, Hard Drive, iPhone, iPad, etc. How to get rid of DVD region code, and play USA DVDs in UK on laptop, TV, Xbox, PS4 etc.? Get 3 easy ways here. [Solved] How to Fix VLC Won't Rip DVD Problem on PC/Mac? Encounter 'VLC won't rip DVD' problem on either Windows PC or Mac OS X? Find the easiest solution from this post. Kaley Torres is a self-motivated, creative copywriter with five years of marketing and advertising experience, specializing in writing on DVD, video, audio, images, new digital contents etc. With a partiality DVD collection, Kaley also enjoys digitizing DVD and is keen to share her DVD ripping tips on social media.